For other uses, see Merino (disambiguation). Today, Merinos are still regarded as having some of the finest and softest wool of any sheep. Poll Merinos have no horns (or very small stubs, known as scurs), and horned Merino rams have long, spiral horns which grow close to the head. It may be an adaptation to the sheep of the name of a Leonese official inspector (merino) over a merindad, who may have also inspected sheep pastures. This word is from the medieval Latin maiorinus, a steward or head official of a village, from maior, meaning "greater". The Merino is an excellent forager and very adaptable. It is bred predominantly for its wool, and its carcass size is generally smaller than that of sheep bred for meat. South African Meat Merino (SAMM), American Rambouillet and German Merinofleischschaf have been bred to balance wool production and carcass quality. Merino have been domesticated and bred in ways that would not allow them to survive well without regular shearing by their owners. They must be shorn at least once a year because their wool does not stop growing. If this is neglected, the overabundance of wool can cause heat stress, mobility issues, and even blindness. Merino wool is fine and soft. Staples are commonly 65–100 mm (2.6–3.9 in) long. A Saxon Merino produces 3–6 kg (6.6–13.2 lb) of greasy wool a year, while a good quality Peppin Merino ram produces up to 18 kg (40 lb). Merino wool is generally less than 24 micron (µm) in diameter. Basic Merino types include: strong (broad) wool (23–24.5 µm), medium wool (19.6–22.9 µm), fine (18.6–19.5 µm), superfine (15–18.5 µm) and ultra fine (11.5–15 µm). Ultra fine wool is suitable for blending with other fibers such as silk and cashmere. The term merino is widely used in the textile industries, but it cannot be taken to mean the fabric in question is actually 100% merino wool from a Merino strain bred specifically for its wool. The wool of any Merino sheep, whether reared in Spain or elsewhere, is known as "merino wool". However, not all merino sheep produce wool suitable for clothing, and especially for clothing worn next to the skin or as a second skin. This depends on the particular strain of the breed. Merino sheep bred for meat do not produce a fleece with a fine enough staple for this purpose. The Phoenicians introduced sheep from Asia Minor into North Africa and the foundation flocks of the merino in Spain might have been introduced as late as the 12th century by the Marinids, a tribe of Berbers. although there were reports of the breed in the Iberian peninsula before the arrival of the Marinids; perhaps these came from the Merinos or tax collectors of the Kingdom of León, who charged the tenth in wool, beef jerky and cheese. In the 13th and 14th centuries, Spanish breeders introduced English breeds which they bred with local breeds to develop the merino; this influence was openly documented by Spanish writers at the time. Spain became noted for its fine wool (spinning count between 60s and 64s) and built up a fine wool monopoly between the 12th and 16th centuries, with wool commerce to Flanders and England being a source of income for Castile in the Late Middle Ages. 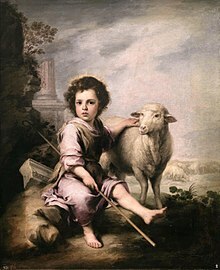 Most of the flocks were owned by nobility or the church; the sheep grazed the Spanish southern plains in winter and the northern highlands in summer. The Mesta was an organisation of privileged sheep owners who developed the breed and controlled the migrations along cañadas reales suitable for grazing. The three Merino strains that founded the world's Merino flocks are the Royal Escurial flocks, the Negretti and the Paula. Among Merino bloodlines stemming from Vermont in the USA, three historical studs were highly important: Infantado, Montarcos and Aguires. Before the 18th century, the export of Merinos from Spain was a crime punishable by death. In the 18th century, small exportation of Merinos from Spain and local sheep were used as the foundation of Merino flocks in other countries. In 1723, some were exported to Sweden, but the first major consignment of Escurials was sent by Charles III of Spain to his cousin, Prince Xavier the Elector of Saxony, in 1765. Further exportation of Escurials to Saxony occurred in 1774, to Hungary in 1775 and to Prussia in 1786. Later in 1786, Louis XVI of France received 366 sheep selected from 10 different cañadas; these founded the stud at the Royal Farm at Rambouillet. The Rambouillet stud enjoyed some undisclosed genetic development with some English long-wool genes contributing to the size and wool-type of the French sheep. Through one ram in particular named Emperor – imported to Australia in 1860 by the Peppin brothers of Wanganella, New South Wales – the Rambouillet stud had an enormous influence on the development of the Australian Merino. Sir Joseph Banks procured two rams and four ewes in 1787 by way of Portugal, and in 1792 purchased 40 Negrettis for King George III to found the royal flock at Kew. In 1808, 2000 Paulas were imported. The King of Spain also gave some Escurials to the Dutch government in 1790; these thrived in the Dutch Cape Colony (South Africa). In 1788, John MacArthur, from the Clan Arthur (or MacArthur Clan) introduced Merinos to Australia from South Africa. From 1765, the Germans in Saxony crossed the Spanish Merino with the Saxon sheep to develop a dense, fine type of Merino (spinning count between 70s and 80s) adapted to its new environment. From 1778, the Saxon breeding center was operated in the Vorwerk Rennersdorf. It was administered from 1796 by Johann Gottfried Nake, who developed scientific crossing methods to further improve the Saxon Merino. By 1802, the region had four million Saxon Merino sheep, and was becoming the centre for stud Merino breeding, and German wool was considered to be the finest in the world. In 1802, Colonel David Humphreys, United States Ambassador to Spain, introduced the Vermont strain into North America with an importation of 21 rams and 70 ewes from Portugal and a further importation of 100 Infantado Merinos in 1808. The British embargo on wool and wool clothing exports to the U.S. before the 1812 British/U.S. war led to a "Merino Craze", with William Jarvis of the Diplomatic Corps importing at least 3,500 sheep between 1809 and 1811 through Portugal. The Napoleonic wars (1793–1813) almost destroyed the Spanish Merino industry. The old cabañas were dispersed or slaughtered. From 1810 onwards, the Merino scene shifted to Germany, the United States and Australia. Saxony lifted the export ban on living Merinos after the Napoleonic wars. Highly decorated Saxon sheep breeder Nake from Rennersdorf had established a private sheep farm in Kleindrebnitz in 1811, but ironically after the success of his sheep export to Australia and Russia, failed with his own undertaking. Merino sheep were introduced to Vermont in 1802. This ultimately resulted in a boom-bust cycle for wool, which reached a price of 57 cents/pound in 1835. By 1837, 1,000,000 sheep were in the state. The price of wool dropped to 25 cents/pound in the late 1840s. The state could not withstand more efficient competition from the other states, and sheep-raising in Vermont collapsed. About 70 native sheep, suitable only for mutton, survived the journey to Australia with the First Fleet, which arrived in late January 1788. A few months later, the flock had dwindled to just 28 ewes and one lamb. In 1797, Governor King, Colonel Patterson, Captain Waterhouse and Kent purchased sheep in Cape Town from the widow of Colonel Gordon, commander of the Dutch garrison. When Waterhouse landed in Sydney, he sold his sheep to Captain John MacArthur, Samuel Marsden and Captain William Cox. By 1810, Australia had 33,818 sheep. John MacArthur (who had been sent back from Australia to England following a duel with Colonel Patterson) brought seven rams and one ewe from the first dispersal sale of King George III stud in 1804. The next year, MacArthur and the sheep returned to Australia, Macarthur to reunite with his wife Elizabeth, who had been developing their flock in his absence. Macarthur is considered the father of the Australian Merino industry; in the long term, however, his sheep had very little influence on the development of the Australian Merino. Macarthur pioneered the introduction of Saxon Merinos with importation from the Electoral flock in 1812. The first Australian wool boom occurred in 1813, when the Great Dividing Range was crossed. During the 1820s, interest in Merino sheep increased. MacArthur showed and sold 39 rams in October 1820, grossing £510/16/5. In 1823, at the first sheep show held in Australia, a gold medal was awarded to W. Riley ('Raby') for importing the most Saxons; W. Riley also imported cashmere goats into Australia. Two of Eliza Furlong's (sometimes spelt Forlong or Forlonge) children had died from consumption, and she was determined to protect her surviving two sons by living in a warm climate and finding them outdoor occupations. Her husband John, a Scottish businessman, had noticed wool from the Electorate of Saxony sold for much higher prices than wools from NSW. The family decided on sheep farming in Australia for their new business. In 1826, Eliza walked over 1,500 miles (2,400 km) through villages in Saxony and Prussia, selecting fine Saxon Merino sheep. Her sons, Andrew and William, studied sheep breeding and wool classing. The selected 100 sheep were driven (herded) to Hamburg and shipped to Hull. Thence, Eliza and her two sons walked them to Scotland for shipment to Australia. In Scotland, the new Australia Company, which was established in Britain, bought the first shipment, so Eliza repeated the journey twice more. Each time, she gathered a flock for her sons. The sons were sent to NSW, but were persuaded to stop in Tasmania with the sheep, where Eliza and her husband joined them. The Melbourne Age in 1908 described Eliza Furlong as someone who had 'notably stimulated and largely helped to mould the prosperity of an entire state and her name deserved to live for all time in our history' (reprinted Wagga Wagga Daily Advertiser January 27, 1989). There were nearly 2 million sheep in Australia by 1830, and by 1836, Australia had won the wool trade war with Germany, mainly because of Germany's preoccupation with fineness. German manufacturers commenced importing Australian wool in 1845. In 1841, at Mount Crawford in South Australia, Murray established a flock of Camden-blood ewes mated to Tasmanian rams. To broaden the wool and give the animals some size, it is thought some English Leicester blood was introduced. The resultant sheep were the foundation of many South Australian strong wool studs. His brother Alexander Borthwick Murray was also a highly successful breeder of Merino sheep. The Peppin brothers took a different approach to producing a hardier, longer-stapled, broader wool sheep. After purchasing Wanganella Station in the Riverina, they selected 200 station-bred ewes that thrived under local conditions and purchased 100 South Australian ewes bred at Cannally that were sired by an imported Rambouillet ram. The Peppin brothers mainly used Saxon and Rambouillet rams, importing four Rambouillet rams in 1860. One of these, Emperor, cut an 11.4 lb (5.1 kg clean) wool clip. They ran some Lincoln ewes, but their introduction into the flock is undocumented. In 1865, George Merriman founded the fine wool Merino Ravensworth Stud, part of which is the Merryville Stud at Yass, New South Wales. In 1889, while Australian studs were being devastated by the imported Vermont rams, several U.S. Merino breeders formed the Rambouillet Association to prevent the destruction of the Rambouillet line in the U.S. Today, an estimated 50% of the sheep on the U.S. western ranges are of Rambouillet blood. The federation drought (1901–1903) reduced the number of Australian sheep from 72 to 53 million and ended the Vermont era. The Peppin and Murray blood strain became dominant in the pastoral and wheat zones of Australia. In Australia today, a few Saxon and other fine-wool, German bloodline, Merino studs exist in the high rainfall areas. In the pastoral and agriculture country, Peppins and Collinsville (21 to 24 micron) are popular. In the drier areas, one finds the Collinsville (21 to 24 micron) strains. The development of the Merino is entering a new phase: objective fleece measurement and BLUP is now being used to identify exceptional animals. Artificial insemination and embryo transfer are being used to accelerate the spread of their genes. The result is a wide outcrossing between all major strains. The world record price for a ram was A$450,000 for JC&S Lustre 53, which sold at the 1988 Merino ram sale at Adelaide, South Australia. In 2008, an Australian Merino ewe was sold for A$14,000 at the Sheep Show and auction held at Dubbo, New South Wales. The New England Merino Field Days, which display local studs, wool, and sheep, are held during January in even numbered years in and around the Walcha, New South Wales district. The Annual Wool Fashion Awards, which showcase the use of Merino wool by fashion designers, are hosted by the city of Armidale, New South Wales in March each year. In Australia, mulesing of Merino sheep is a common practice to reduce the incidence of flystrike. It has been attacked by animal rights and animal welfare activists, with PETA running a campaign against the practice in 2004. The PETA campaign targeted U.S. consumers by using graphic billboards in New York City. PETA threatened U.S. manufacturers with television advertisements showing their companies' support of mulesing. Fashion retailers including Abercrombie & Fitch Co., Gap Inc and Nordstrom and George (UK) stopped stocking Australian Merino wool products. The Animal Welfare Advisory Committee to the New Zealand Ministry of Agriculture Code of recommendations and minimum standards for the welfare of Sheep, considers mulesing a "special technique" which is performed on some Merino sheep at a small number of farms in New Zealand. In 2008, mulesing once again became a topical issue in Sweden, with a documentary on mulesing shown on Swedish television. This was followed by allegations of bribery and intimidation by Australian government and wool industry officials; the allegations were disputed by the wool industry. Several European clothing retailers, including H&M, stopped stocking products made with Merino wool from Australia. 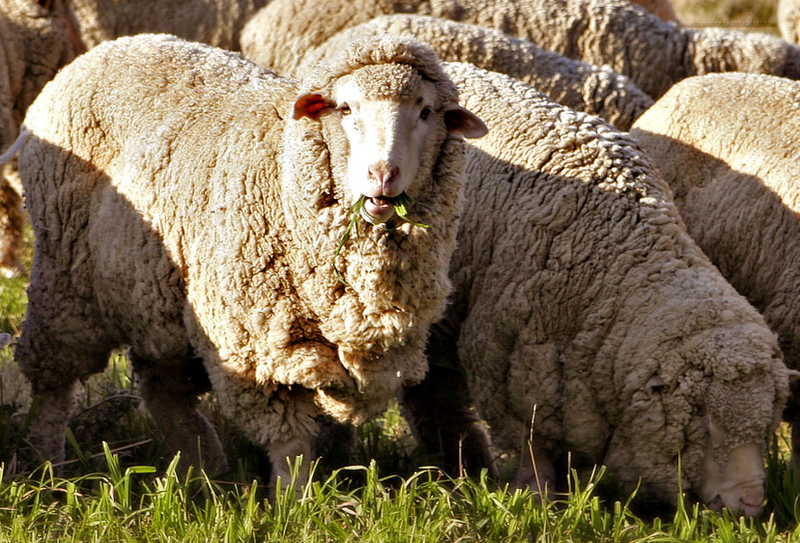 New strains of Merinos that do not require mulesing are being promoted in South Australia. 'Thin-skinned' sheep from western Victoria are also being promoted as a solution. ^ "Merino wool". Oviedo, Florida: NuMei. Retrieved 27 November 2015. ^ Corominas, Joan; Pascual, José A., eds. (1989). "Merino". Diccionario Crítico Etimológico Castellano e Hispánico. IV. Madrid: Gredos. ISBN 84-249-0066-9. ^ The Macquarie Dictionary. North Ryde: Macquarie Library. 1991. ^ "Breeds of Livestock - German Mutton Merino Sheep". Ansi.okstate.edu. 1998-12-10. Archived from the original on 2012-09-14. Retrieved 2012-08-20. ^ Paterson, Mark (1990). National Merino Review. West Perth, Australia: Farmgate Press. pp. 12–17in 18600. ISSN 1033-5811. ^ a b Ross, C.V. (1989). Sheep production and Management. Engleworrd Cliffs, New Jersey: Prentice Hall. pp. 26–27. ISBN 0-13-808510-2. ^ "Vermont Historical Society - William Jarvis's Merino Sheep". Vermonthistory.org. Retrieved 2012-08-20. ^ Mary S. Ramsay, 'Forlong, Eliza (1784 - 1859)', Australian Dictionary of Biography, Supplementary Volume, Melbourne University Press, 2005, pp 130-131. ^ "S.A. Merino Rams in Queensland". The South Australian Advertiser (Adelaide, SA : 1858 - 1889). Adelaide, SA: National Library of Australia. 19 June 1861. p. 2. Retrieved 2 September 2012. ^ J. Ann Hone, 'Peppin, George Hall (1800 - 1872)', Australian Dictionary of Biography, Volume 5, Melbourne University Press, 1974, pp 430-431. ^ "Abercrombie & Fitch Pledges Not to Use Australian Merino Wool Until Mulesing and Live Exports End". PETA.org. Retrieved 2012-08-20. ^ "Swedish consumers 'concerned' by mulesing". Australian Broadcasting Corporation. 7 March 2008. Retrieved 2008-03-08. ^ "Bribe claim rocks wool trade body". The Age. 8 March 2008. Retrieved 2008-03-08. ^ "ABC misreports Swedish TV mulesing program". The Australian Wool and Sheep Industry Taskforce. 12 March 2008. Archived from the original on 9 May 2008. Retrieved 2008-03-14. ^ "H&M Stops Selling Australian Wool | Ethisphere™ Institute". Ethisphere.com. 2008-02-19. Archived from the original on 2012-03-29. Retrieved 2012-08-20. ^ "Scientists search for bare-bum sheep gene". Australian Broadcasting Corporation. 21 March 2005. Retrieved 2007-11-25. Cottle, D.J. (1991). Australian Sheep and Wool Handbook. Melbourne, Australia: Inkata Press. pp. 20–23. ISBN 0-909605-60-2. Wikimedia Commons has media related to Merino (breed). Wikisource has the text of the 1921 Collier's Encyclopedia article Merino. This page was last edited on 10 April 2019, at 11:31 (UTC).